The season 23 episode “Holidays Of Future Passed” is held up as one of the best of the late-run Simpsons, telling a story about the Simpsons some 30 years down the line with a generous helping of heart and an abundance of clever, funny jokes. Conceived as a possible series finale when Fox was seriously considering pulling the plug, it wouldn’t have been the worst way to go out—for all the Futurama-style sci-fi wackiness, the episode actually does pay off almost everyone’s story with the respect it deserves, envisioning a time when the deep familial bonds of the show’s central characters would provide the fuel for as satisfying a payoff as 23 years of TV could get in 23 minutes. Giving writer J. Stewart Burns all due credit for pulling that episode off to the extent that he did, it was still an unsettling episode of The Simpsons. For one thing, it was the only “future Simpsons” story (unlike the stellar “Lisa’s Wedding,” for example) which offered no alternative explanation for what was being shown. It wasn’t a dream sequence, a vision, or a “Treehouse Of Horror”—in the continuity of the series (such as it is), this is what’s going to happen to these characters and, even if Al Jean’s prediction comes true and we see new episodes well into the cast’s collective dotage, every story will lead to this future and nothing more. It’s limiting and, on a real level, disheartening. As lackluster as The Simpsons has become over the years, the endless wellspring of its Springfield’s elastic reality always holds out hope that the show can be righted again with each new installment. As good an episode of TV as “Holidays Of Future Passed” was, it also took a lot away. Things are even worse for The Simpsons after tonight’s sequel, “Days Of Future Future,” where Burns returns to the (it seems) inevitable sci-fi future of the series and limits the show’s world even more. Losing much of the heart of its predecessor in favor of the sort of ill-conceived and contradictory character arcs the latter, scattershot Simpsons has become notorious for, “Days Of Future Future” reveals a series willing to shrug off what it still could be. Instead, this future Simpsons world seems just a playground for writers to use up whatever Futurama jokes they had left over. Once again, we’re given no out, no framing device—Homer dies and gets repeatedly cloned by Professor Frink, Lisa and Milhouse are still unhappily married but there are zombies and Milhouse gets infected, Bart’s still a slovenly divorced dad. This is the future that was laid out before and this is what’s going to happen. Except here, the episode either plays it loose with the continuity of character and plot it set up before (where Homer had given up drinking, become wiser and more considerate, and—oh yeah—wasn’t a disembodied consciousness in a robot body), or just goes off in broad, nonsensical directions (Lisa prefers zombie Milhouse because why exactly?) 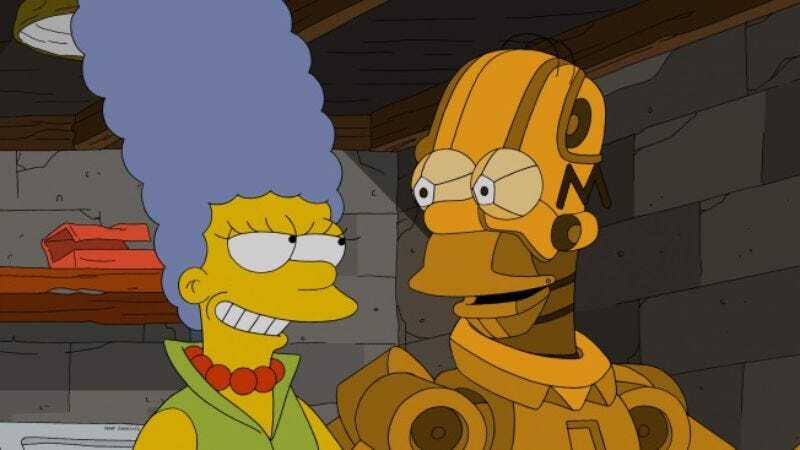 Even when the middle part of the episode is revealed to have been the depressed Bart’s Total Recall/Eternal Sunshine Of The Spotless Mind fantasy, the ending reestablishes the robot body/zombie plotlines as future Simpsons canon. Keeping with the sci-fi theme, it’s like this season’s storytelling indifference went back in time and infected a much better thought-out episode from two years ago. There are some funny gags in the episode, although not nearly as many as in its predecessor, or as clever. When Bart and ex-wife Jenda (Amy Poehler, somehow making very little impression) are having dinner at The Gilded Truffle, Gort from The Day The Earth Stood Still looks to be their busboy. Which is a reference, but not a joke as such. (I did appreciate that in the future Skinner still dines with his dead mother and that Maggie seems to be on a date with unibrow baby.) What’s even worse is how this episode undermines much of the effective sentiment from “Holidays Of Future Passed.” There, Lisa and Bart had a funny, insightful, improbably moving drunken bonding session, so here they have another, joined by Marge. Only here, both their conversation and Marge’s inspirational speech about sticking with the decisions your heart makes are rushed and perfunctory, and slightly undermined by Marge’s decision to commit suicide (?!) so she can live as a Candy Crush-playing head with Homer. And yes, I understand that this sequence is part of Bart’s fantasy, but that doesn’t make it any better. It, like much of this episode, plays out as a pale retread. If Matt Groening and his people want to bring Futurama back, I’d be interested in seeing what they’d come up with. 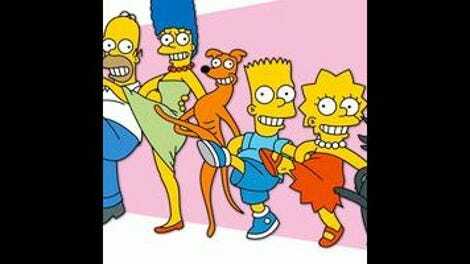 But having that show’s signature elements bleed into The Simpsons is, like the future Simpsons’ unfortunate pet, a hybrid creation that isn’t good for anyone. Those dinosaur jokes are lifted directly from Futurama, though, aren’t they? Loved Hank Azaria’s understated performance as Jenda’s new fella, Jerry. He’s as nice and understanding as any insectoid alien with a xenomorph jaw could be. Part of Bart’s fantasy though it may be, the smutty joke about Miss Hoover just—excuse me—sucked. The “next week on The Simpsons” tag accurately references how random and meaningless are the clips in every Mad Men preview—which, while not precisely a joke or connected to anything in the episode proper, has a few funny bits. Lenny’s angry “I said no mayo” is followed by Mr. Burns ordering “Release the—“ before being cut off. Release the what? Release the what? !